The cause of gum disease is the same in cats and dogs as it is in people. 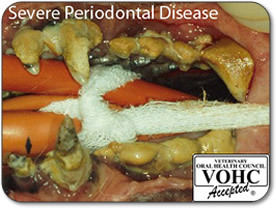 Gum disease is an infection resulting from build-up of soft dental plaque on the surfaces of the teeth around the gums. The bacteria in dental plaque irritate the gum tissue if plaque is allowed to accumulate, which often leads to infection in the bone surrounding the teeth. Hard dental tartar (calculus) consists of calcium salts from saliva deposited on plaque. Tartar starts to form within a few days on a tooth surface that is not kept clean, and provides a rough surface that enhances further plaque accumulation. Once it has begun to grow in thickness, tartar is difficult to remove without dental instruments.